The romantic piano recital is a genre of compact disc which seemingly never goes out of fashion. Record companies churn out heaps of what amount to highlight-reels of the most famous and most saccharine outpourings of Chopin, Liszt, Debussy, Beethoven and Brahms. Just a few weeks ago, I had occasion to review one such offering, Universal Classics’ compilation “Romantic Piano Pieces” with performer Israela Margalit. There was nothing particularly wrong with it, but nothing inspiring either, just many of the old favorites played with devotion, if not with imagination. This collection is very different. Edward Rosser is a deeply intelligent artist, not just at the keyboard but at the drawing board: he has designed this program to argue a point, not to provide background music for a candlelit dinner. As a result, all of the famous names are here - Beethoven, Brahms, Chopin, Debussy, Schubert and more - but not for the works you might expect. And Rosser curated this recital program with the aim of bringing the listener’s focus on two broad trends found within: all of these works are deeply reflective, and all come from the last years of their composers’ lives. Rosser’s liner-notes make for an exceptionally interesting read, especially while listening along. In his words, “The works on this recording, all late or last piano compositions by many of the greatest composers for the piano, were all chosen precisely because they seem to illustrate, in differing ways, [an] enlargement of the spirit that seems to accompany the great artist’s awareness of his own mortality.” Rosser has remarkable insights about the characteristics of these composers’ late styles, as well as side remarks on Japanese art, Shakespeare, and the last time Brahms ever saw his dear friend Clara Schumann; the liner-notes are very nearly worth the price of the disc. But there is music, too, and the most immediately striking thing about this album - you notice it from the first note - is Edward Rosser’s extraordinary control of tone: soft, luminous, with a cool glow of natural beauty about it, the Steinway D captured in frankly perfect sound. The piano, sound, and player are a perfect match for the program. The program itself, of the legendary composers’ late and last works, should by rights run dangerously close to monotony - after all, this is all slow, quiet, reflective music - but it does not, thanks to Rosser’s ability to differentiate between dynamic levels with remarkable precision. If most of the playing on this album is soft, that is because Rosser is capable of infinite shades of softness. Some interpretations stand out. The Liszt “Wiegenlied” is beautifully simple; the Beethoven bagatelles again surprise me that as tempestuous a man as he could write such content, blissful music; the Debussy Album Leaf is evocative, Rosser’s left-hand gently insistent, though the music still produces a great feeling of tranquility. Debussy’s miniature “Evenings lit by burning coals” is a remarkable discovery, a miniature which might have brought moonlight or the flicker of a candle to my mind had I not seen the title. This appears to be one of just two appearances of the work outside of a complete Debussy cycle. On the other hand, the Brahms Intermezzo in A, Op. 118 No. 2, sounds rather like easy-listening in its central pages, and Chopin’s mazurka Op. 68 No. 4, his last work, is peaceful but does not really retain the rhythm of the mazurka dance-form itself. Here it sounds rather more like a nocturne in miniature, and though I suppose few listeners will object to the idea of another Chopin nocturne, I prefer the peppier but still soulful approach of Garrick Ohlsson or Andrzej Wasowski. 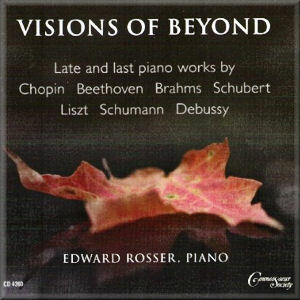 On the other hand, Edward Rosser’s Berceuse is simply perfect; I would not be surprised if he was playing with eyes closed, lost in wonder, but in fact the performance has a mastery of tonal shading and rubato that reminds me of pianists like Ivan Moravec. I am not entirely sure that I agree with Rosser’s thesis, that at the ends of their lives composers reach a state of reflectiveness which enables them to write music like this. It really depends on the composer. Rosser certainly had to do some stretching to get the music to agree: the Schubert sonata extract is 11:58 to Dejan Lazic’s 9:55, Andras Schiff’s 9:00, and Michael Endres’ 8:05. But about this I find it hard to complain: Rosser’s Schubert is a remarkable experience, with a stillness, pureness and shy perfection difficult to put into words. Suffice to say that, having heard this, it will not be easy for me to go back to the Schubert of other pianists. And, though there is a glint of a tuning problem at 6:11, the brave pause Rosser takes at 7:00, before the opening theme returns, reminds us once again that we are in the presence of a pianist with an extraordinary expressive gift and the courage (and good taste) to see it through. Besides, this is one case where to provide a critique is not quite to do the program justice. Edward Rosser is here neither to obey the composers’ intentions to the last letter nor to impose his own will on the unwilling music. He brings to the recital a greater artistic vision that frames these works as part of a narrative, even an argument. And to listen to that narrative told so well, by a performer with such an understanding of the story, is a sublime experience. As piano recitals go, “Visions of Beyond” is well beyond the ordinary.